Eruca Sativa. I’ve heard people refer to this distinct salad leaf by a variety of names: Arugula. Rucola. Rocket. Pond weed? Ok so that last one was from a friend who seemed violently opposed to eating the arugula salad I had made for dinner. It seems like people either love it or hate it. When I first encountered arugula, it had been scattered through a mixed leaf salad – the bursts of bitterness throughout the salad and the moorish peppery notes left me searching my plate for more. I had decidedly chosen the love-it camp. When using arugula, I think the key is to use it in moderation and to make sure the leaves are young and not too bitter. 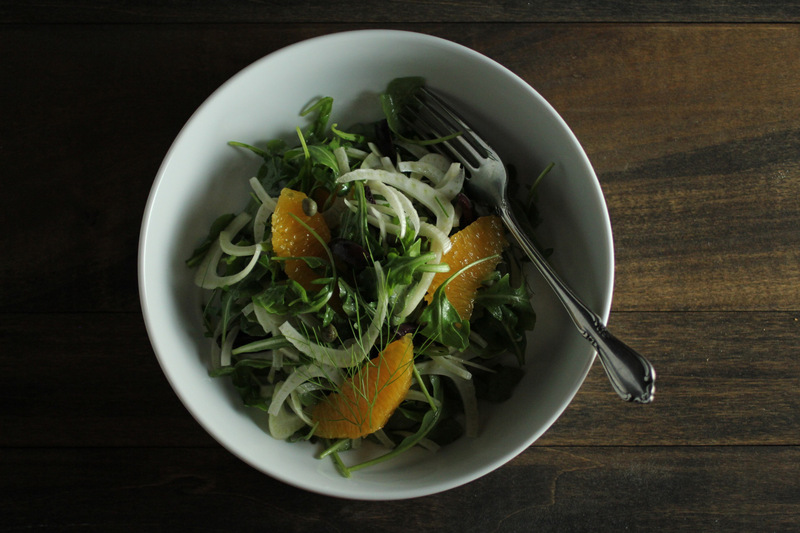 Today I made an arugula, fennel and orange salad – a tangle of sweet licorice notes and peppery arugula, highlighted by luscious orange segments and salty bursts of capers and olives. Although Mr. Pepper isn’t a fan of licorice, he enjoyed this salad – I hope you do too! Slice the fennel bulb very thinly. I used a mandolin so that the slices were cut as thinly as possible. Carefully cut the peel and pith from the oranges and cut the segments out from the membrane. Set the left over membrane aside. Roughly chop a small bunch of the fennel fronds. 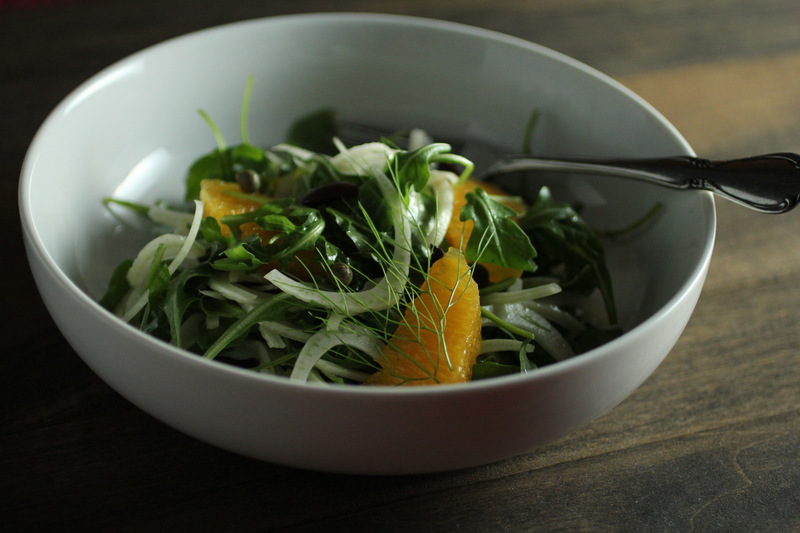 Combine arugula, sliced fennel, fennel fronds, orange segments, olives and capers in a large bowl. In a small bowl, combine the red wine vinegar, olive oil, salt and pepper to taste. Squeeze some of the orange juice from the membrane to slightly sweeten the vinaigrette. Pour the dressing over the salad and toss lightly. If you are a salad dressing junkie, feel free to make more dressing!